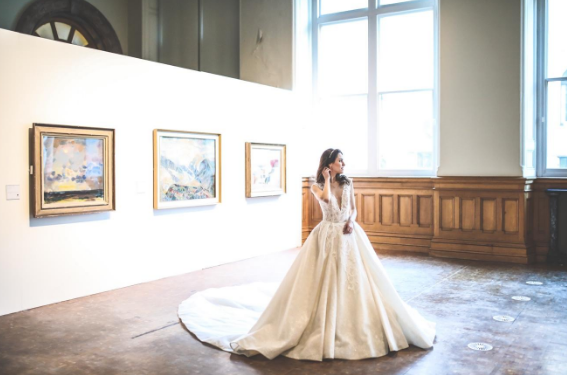 Whether you’re looking to say yes to the dress, size up a well-groomed suit, capture your day in perfect detail, or find the blooms for you, Birmingham Museum & Art Gallery is bringing together the Midlands’ best wedding experts to get bride and grooms-to-be set for the big day. If you’re on the hunt for more stylish and unique ideas, then look no further than The BMAG Wedding Fair, taking place on Sunday 19 May. A showcase for the style savvy couple ready to tie the knot, this wedding fair will take place in the stunning surroundings of the Grade II listed building’s Waterhall, with a whole range of handpicked local exhibitors coming together for this one-of-a-kind event. One of the region’s leading bridal boutiques, June Peony Bridal Couture, will be taking centre stage to showcase stunning gowns in a series of catwalk shows throughout the day. Whilst Elegant Entertainment will be serenading brides-to-be with their live acoustic performers, providing the perfect accompaniment to the live shows. From photographers to florists, accessories to entertainment and everything in between, The BMAG Wedding Fair ties together all the little touches to get you set to tie the knot. Exhibitors include Birmingham’s best tailors Clements and Church, beautiful bouquets by Bloom Collective, and so much more. Capturing your day in perfect detail and catching memories to look back on forever, your wedding photographer is an important factor for your big day. Chat to the people behind the lens with photographers including Wedding By Manos. The stunning venue will be dressed by some of the region’s best, including Trees by Design, House of Herlihy and Posh Walls, who will all be showcasing everything from blossom trees to flower walls and even a floral swing! The BMAG Wedding Fair is taking place on Sunday 19 May from 12pm – 3pm and tickets are FREE. Whether you’re a bride-to-be, the lucky man or member of the ‘bride tribe’, sign up for yours here. For a full list of exhibitors and more details about the event, please head to the Facebook page.